Through a potentiometer the signal reaches the grid of the triode in the combi-tube 14GW8, which combines a triode and a pentode in a slender cylinder tube. At its cathode to an RC circuit is an adjustable R to control the gain of the triode. The anode then controls via an RC circuit, the control grid of the pentode. Through its cathode follower circuit, a low internal resistance is achieved. At the cathode, then the signal will be coupled out, while dc components are being eliminated by a capacitor. Along a fuse and two Z-diodes for overvoltage protection, the signal then reaches the headphones. A special feature is a stabilizer tube in the circuit, the anode voltage of the triode-pentode keeps constant regardless of its amplitude. The latter is DC heated via RC-element and double buffering. Its screen grid is powered by an RC-screening. The goal was an absolute hum-free operation of the headphone amplifier. For the amplifier stages and the power supply we use new tubes from old stock of such Valvo, Philips, Telefunken and Siemens recourse that remain available. 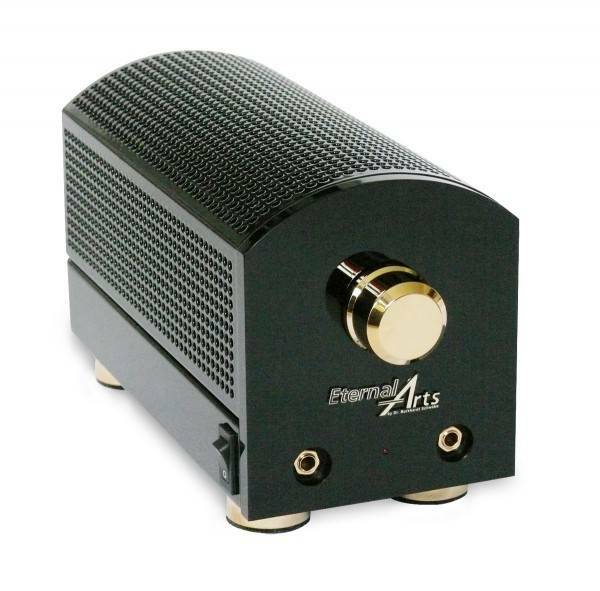 Related links to "EternalArts OTL Headphone Amplifier"
Customer evaluation for "EternalArts OTL Headphone Amplifier"